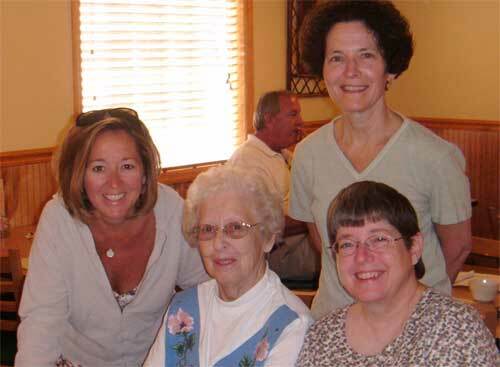 I and my next older sister (left and in back) live on the East coast and were able to visit Aunt Margie in August, but were not close by during her final weeks of life. This is where the right place… right time scenario comes into play. My oldest sister (right) lives about 1 1/2 hours from my father, my deceased aunt and other elderly relatives. She has been our ‘eyes and ears’ on how things really are with our aging family for some time now. She had been back and forth for a couple of weeks prior to Aunt Margie’s passing and had not only been communicating the reality of the situation (which is difficult to ascertain over the phone), but also providing spiritual guidance and taking advantage of God Moments along the way. There were many, but this is the one that I wish to share with you. In closing, I would like to share one final remembrance of Aunt Margie. These past two months have been very difficult and so sad to see a life full of vitality and energy dwindle away to nothing. But even in her last few days of life on this earth, she has been a fighter! I will always hold the memory in my heart and mind of last Tuesday night when I drove from West Lafayette to come and be with Aunt Margie knowing that it may be the last time that I would be able to share with her while she was on this earth. Have you ever heard of God Moments? I have lots of those, but I know beyond a shadow of doubt that Tuesday night was one of the most powerful God Moments I have ever had. Reading scripture to her and praying for her and singing to her… I know she heard us. I know she felt the love and compassion from us there in the room and from all of those who had been praying for her. What my sister did not mention was that as she was finishing up at work, that day, she felt overwhelmingly compelled to make a drive to the hospital. She wasn’t certain how long she was going to need to stay, nor what she was going to do. She was so drawn with urgency that she didn’t even take time to stop by her house for clothes or a toothbrush. She was drawn to Margie’s side. My sister had a supernatural peace within and clarity of thinking as she drove. She wasn’t certain what was going to transpire, but felt the call of the Lord to be there. She went as the Spirit led her to that small hospital room. That night without any forethought she began singing hymns in the hospital room, reading scripture and ministering to a strong spirit and dying body. She led Aunt Margie’s spirit in a final time of worship and praise to our King. Aunt Margie had her heavenly reunion the very next day. I told my sister many times in the last 14 days that I was glad she was there and that she was the right one to be there. I wasn’t certain that I could have been as strong as she was. She only replied with it wasn’t her. She took no credit for any of the love, adoration, ministering or care that she gave. I believe that she was the one that had been appointed a very long time ago to be the one to minister at that place… at that time. It reminds me of Queen Esther in the Bible. How she was an unassuming, ordinary woman who had been placed in an unexpected position (unknowingly) to do a specific job at a specific time. Esther 4:14 says, And who knows but that you have come to your royal position for such a time as this? You know… we all have been created for a purpose… a divine destiny. For some of us that purpose is clear and we go about fulfilling that purpose willingly. For others of us… it is less clear and in some cases we are reluctant participants. I’m not certain if my sister’s actions were something that she wanted and desired to do… I only know that she was obedient in doing what the Lord led her to do. She was divinely appointed and positioned by God at the right place and right time ‘for such a time as this’. What have you been positioned by God to do? Are you willing or unwilling? Remember that God doesn’t call those who are prepared… He prepares those He calls!